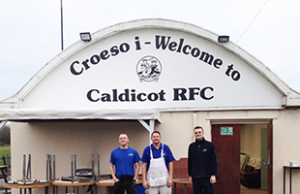 In December 2016 Capsel’s painting and decorating team, alongside staff from Monmouthshire Housing Association (MHA), helped to rejuvenate Caldicot RFC’s clubhouse as part of MHA’s volunteer scheme. Caldicot RFC approached MHA for sponsorship to help renovate the clubhouse as the local hub badly needed repairs and re-decorating works. 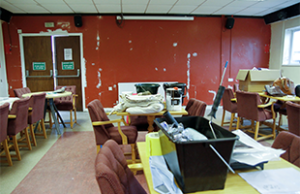 The clubhouse – which is regularly used by MHA staff to meet up and support local tenants – needed a spruce up. Boasting a games room, function room and bars, the clubhouse can also fully cater for Sunday lunches and meals. Capsel painters Mark, Rudi and Joel donated their time to coordinate painting with the help of MHA staff. Capsel coordinated sourcing of materials with paint donated by C Richardson Contractors and Glanmor Developments. 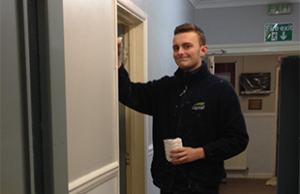 The function room and entrance hallway were given an overhaul, while carpentry for a new hatch was supplied by Glanmore Developments. The function room, lounge and bar were also re-fitted with new lighting donated by CW Electrics. The renovation work will benefit local MHA tenants, but also the club itself as a venue for functions.